As with cheese, butter has come into the firing line in recent years because of it's association with weight gain, high cholesterol and heart disease. However, a small amount of butter in an otherwise balanced diet is absolutely fine. 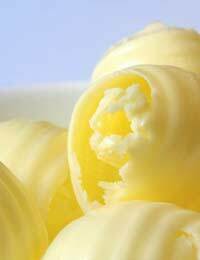 You should also consider the ingredients in the butter alternatives, such as low fat 'spreads'. These spreads and margarines often contain a plethora of chemicals and trans-fats. Trans-fats are widely thought to be more of a risk in terms of contributing to coronary heart disease than animal fats. So there is even more reason to try making your own butter - not only can you exercise quality control but have power over what goes into making this product. Choosing organic ingredients will mean that you can be confident that your butter will not contain additional hormones or pesticides that would otherwise not be listed in the ingredients. Choosing organic will also ensure that the standard of animal welfare of the cows and their calves is much higher. On the other hand, locally sourced milk will ensure that the food miles travelled by your butter are not excessive, and that you are able to support farmers within your region. Dairy farming in particular has had a really tough time of it in the past few years, so supporting farmers - particularly smaller farms - is vital for the survival of this home industry. Before leaping into a butter making frenzy, it's good to understand the ingredients you'll be working with. This article is looks at how to make butter in its most simple form - salt and double cream (whipping cream will also work) from cow's milk. To make butter in this way you must have the butter at room temperature. The milk should be brought up to room temperature naturally - heating it on the hob to raise the temperature will cause other processes that will hamper your butter making efforts! If you have a dairy thermometer, room temperature is around 20C/68F. It is crucial to remember that homemade butter will not last as long as commercial shop-bought butter. It can be frozen for around three months maximum, but it is best to add any flavouring or salt once it has thawed out. Butter making in this way is so simple that all you'll need is either a (sterile) food bag or fairly large jar complete with lid. There is an alternative method whereby you can use an electric whisk (that will save you a lot of arm ache!) with a 'K' beater-type attachment. Similarly, a food processor can be used in place of the bag or jar, but ideally it will have a few different speed settings. 1. The method to make butter is stunningly simple, but will involve a lot of hard work by hand. You can fill the large jar or plastic food bag (tied closed!) with the whipping cream and simply shake the contents until the cream turns to butter. Be aware that this can take anything from 30 minutes to a full hour, so perhaps is left to the very enthusiastic and fit! 2. Alternatively, you can put the cream into an electric food mixer bowl. Rather than the balloon whisk, it is best to opt for a K-beater style whisk. You can start mixing the cream on a fairly high speed, but once it stiffens and starts peaking, you should slow the speed. 3. You will notice that the stiffened cream will start to change to more of a yellow colour. Small amounts of butter may start to become apparent whilst the 'cream' separates into buttermilk (liquid), and before long you will find that your butter starts to take effect. It will start to lump together into more of a solid mass and separates completely from the buttermilk. Remember to keep the processor on mixer on a low speed at this point. 4. Now you can take the separated buttermilk and store it in the fridge later for use in baking (think buttermilk filling/icing etc.). Remember to date the storage container. It is vital that all the buttermilk is separated otherwise it will cause the butter to go off very quickly. Separating is much easier if you have used a mixer and not a jar or bag, as you will be able to remove much more of the buttermilk initially. However in both cases you will still need to wash the butter to rid it of buttermilk completely. To separate the two, you can add cold water to your mixer bowl and using the lowest setting available, allow the water to wash over the butter. Repeat until the water runs completely clean (remember to keep it cold). 5. Once you are sure that the butter is free of buttermilk, you can then press it into shape. You can buy special paddles from cookware shops with decorative presses to place on top. 6. As aforementioned, you could freeze the butter at this point, without adding any salt. However if you intend to use the butter straight away, you can salt now. Remember to salt to taste - always adding very small amounts. 7. To store your butter, either keep in a special butter dish in the fridge or wrap in greaseproof paper. The butter should be stored in the fridge until it is needed. It will need to warm up at room temperature before it can be spread.